The OLED (Organic Light Emitting Diode) luminous panels are reinventing interior and home lighting. Relying on the latest development in nanotechnology, it is among the most efficient light source available today. The ultra thin luminous surface uses ultra-low energy, is long-lasting, heat-free and soft for the eyes. And due to a high rate of recyclability the OLED is among the most environmental friendly light sources. 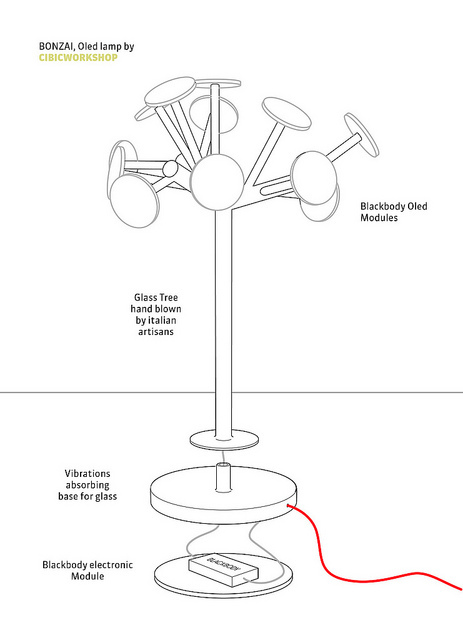 The result of the collaboration between Italy-based CibiWorkshop and OLED lighting brand Blackbody from France was presented at Milan Design Week 2013 (9-14 April). The Blackbody Bonzai lamp based on OLED lighting source and made of hand-blown glass is a top achievement in mixing green high-end technology and artisan craftsmanship. The Blackbody Bonzai lamp features 12 circular OLED panels of 5,8 cm diameter, offering a color temperature of 3000K, efficiency of 25 lm/W and 2000 cd/m2 brightness. 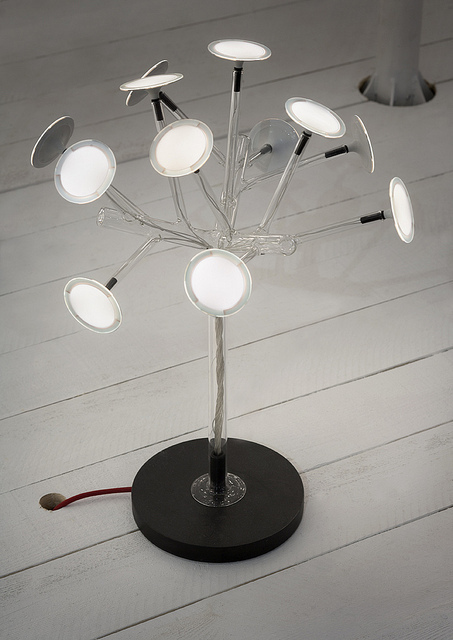 The dimmable tree glass structure is made in Italy by high quality craftsmen. Blackbody, a brand by OLED pioneer Astron Fiamm founded by Bruno Dussert-Vidalet and Alessandro Dolcetta, creates - in collaboration with leading designers - unique, innovative and high quality lighting with OLED technology. CibicWorkshop, the research center founded by Aldo Cibic, gathers designers and architects that work on interdisciplinary projects including environment development, new services concepts and product design.